Lorri Vodi Rupard: "These Heart Things are Unpredictable"
It's the alarm you feel at your own palpitating heart upon it registering the news that someone else's child is found face down on the blacktop. And can the weary get no peace? Your husband interrupts a seven-day trip to Canada on day 3 at 4 AM. Yes, you will board an early AM flight out of here and no you don't mean to under-react. You barely went to bed, it's the fatigue talking. The flying. Though you wonder if it's the taking half a Klonipin afterward instead. Then out of some blue the abnormal rhythm resumes. You look in the mirror. For real? It's been 24 years. This never would've happened if you'd just stayed asleep. It was a similar thing at 15-scary and embarrassing. You were walking to the drugstore nearly late for work; punctuality your most pressing issue. The constant watch checking and general anxiety seems so silly in review but it was all you knew about reliability back when you were trying so hard to do everything right. You'd just rounded the corner past Sir John A. MacDonald Elementary where you paused upon seeing your little sister's artwork scotch taped to the classroom window facing outward. "Amy" her name was scribbled in messy crayonmanship and you could make out a family-yours ostensibly but with an extra child thrown in or large boy doll in a striped shirt wearing uneven platform shoes, his hair bright blue. Then the regular pressing in your chest became this unfamiliar scampering rodent, a sputtering, something befitting an old jalopy. You froze in terror. Your eyes got dark and wide---you didn't know what was happening but anything this startling was bound to be significant. Was something about to end? You were alone and helpless so you flew like a sparrow doubling back toward home trying to elude the emergency but with no way out and no presence of mind to get there. Too far. Instead you ran toward a strange door not knowing what you would say- can't think- when it was opened and the man in his housecoat who answered, looked down at you and blinked. While he was blinking, Mark was still dead or what have you---not yet alive. Unborn. Negative 20 years. Neither of you knew of his dormancy then let alone the day when in his senior year he'd announce with finality to the class that he'd decided he was going to be a cardiac surgeon. Going to be. Like the intro to a magic trick. That's the funny thing, the way it sounded like he'd landed a role just as if the title was a character one struck and all that was needed was a convincing costume. And he bought the costume for $18 online. He was so hopeful; so tragic with zeal. You can still picture his scrawny frame appearing at the door one morning, bright and chipper, smiling like the man of the hour, like he was well on his way though he was just drowning in a fresh crisp lab coat and you yourself, his teacher, promptly turning your face to hide your lip curling upward over the sweet geekiness of it all, the way the unsullied cotton, chafed against his pale knuckles and also drooped too low past mid-calf like a factory second as if the one-size-fits-all algorithm had lost its marbles. It broke your heart; he looked like a little boy with a humongous dream. This episode though. This one goes on and worries you and should've stopped like the others but seems to want to bookend an era. The flutter, insistent enough, makes you pace through the night-it's precisely why you can't sit still in a chair or go drink some tea. It's why you can't cry. You can't even think to cry. What creature are you with a heart so weak but impervious that it's Ziplocked and torpid-a frozen chunk on the counter yet an irregular nuisance? Your body is not yourself; you know this. It's a genetic mutation that could turn into a freak incident at the drop of a hat. You take the other half a Klonipin and reexamine every scenario over the course of an hour until it finally stops. Perhaps a protein deficiency in primordial life. Mother swore you ate nothing but Cheerios for 24 months. Dry. Maybe it's her fault. She forgot the folic acid. But she didn't know anything, nor did any doctor pre-Google. Good Lord, she almost took Thalidomide. And slept you on your belly. Once home, you dress for the occasion and are off put by funereal gaudiness. But aren't they usually like this and you're here for the parents because no one can even imagine. It's a small Southern town and fairly bourgeois though Christians ought to believe he's Mark nevertheless and exultant despite this early transition. People are crying and wailing, some of it sincere. Your intolerance starts to show. He was your prized student; an earnest bright thing. Beloved. But these proceedings as well-intended and necessary as they may be--the two-hour line to stand there and gawk at something Mark long abandoned, the shell of a boy propped up like ad food, the despair about his short, intense life and everyone here his best friend, ever--these theatrics estrange you from his heart. The one he complained to you about a week before his passing. You told him you didn't sleep well and to be prepared for a crappy lesson and he told you that at least you didn't have what he had: chest pain all night. It was the precise reason he hadn't gone for a run. You dismissed it as stress; you would know. You said he was far too young for anything really bad to happen. Then you booked him to tutor your daughter because she was failing. Physics. For which you still owe him ten bucks. You're thinking too much though and listening too hard to your own chest. Then you overhear a mother predicting with savor that her son will likely die young too. It baffles your brain that all this should've been hers. Your husband, the cardiologist stands by the parents with ready assurance. Mark was alone when he died but it's nobody's fault. These heart things are unpredictable. If it wasn't this week or next year, it would've eventually happened. No one could have done anything different. 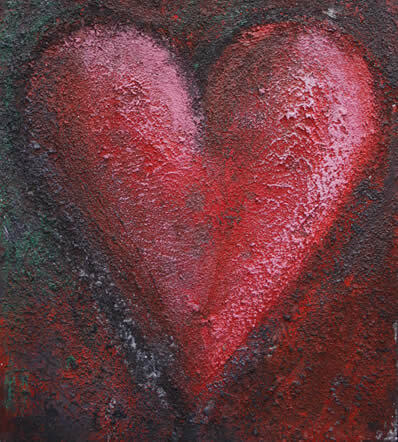 Jim Dine was born June 16, 1935, in Cincinnati, Ohio. He studied at night at the Cincinnati Art Academy during his senior year of high school and then attended the University of Cincinnati, the School of the Museum of Fine Arts, Boston, and Ohio University, Athens, from which he received his B.F.A. in 1957. Dine moved to New York in 1959 and soon became a pioneer creator of "Happenings", together with Allan Kaprow, and Robert Whitman. He exhibited at the Judson Gallery, New York, in 1958 and 1959, and his first solo show took place at the Reuben Gallery, New York, in 1960. Dine is closely associated with the development of Pop art in the early 1960s. Frequently he affixed everyday objects, such as tools, rope, shoes, neckties, and other articles of clothing, and even a bathroom sink, to his canvases. Characteristically, these objects were Dine's personal possessions. This autobiographical content was evident in Dine's early Crash series of 1959-60 and appeared as well in subsequent recurrent themes and images, such as the Palettes, Hearts, and bathrobe Self-Portraits. Dine has also made a number of three-dimensional works and environments, and is well-known for his drawings and prints. He has written and illustrated several books of poetry.